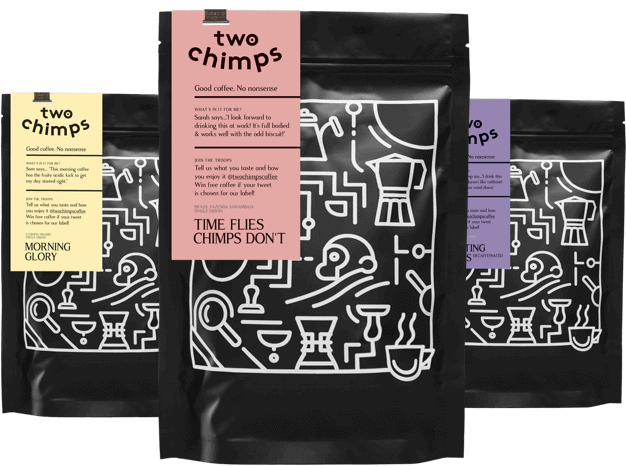 Two Chimps are on a mission to fill the gap between pod machine coffee drinkers and speciality coffee drinkers by offering fresh, hand-roasted speciality coffee straight to your door. Here at Two Chimps Coffee we hand roast ethically sourced, single origin speciality coffees direct from our roastery in Rutland. Our coffees come to us from small farms and cooperatives around the world. This makes our coffees extra special because when a coffee runs out, it will be gone for good. Although this means we change our coffees from to time, just think about how many you will be able to try! Not only does freshly roasted speciality coffee taste fantastic, but it does it’s bit for the world too. We pay between 30 and 150% more than the ‘going rate’ for our green beans to make sure the farmers who lovingly grow and harvest such a superior product are paid correctly for their work and efforts. We purchase our green coffee through a select number of UK based importers who have a direct relationship with farmers, estates and cooperatives globally. As mentioned, from time to time we change our coffees as and when they run out. When this time comes, we use a process known as ‘coffee cupping’ to help us choose its replacement. Coffee cupping involves sampling a number of coffees (normally between 3 and 6 to give us some choice) which have been brewed in the same way. This way, any differences have come from the coffee alone and not the brewing method. Once we have ‘cupped’ every coffee and we agree, we place an order with the importer. We firmly believe that fresh is best. With this statement in mind, we freshly hand roast coffee multiple times each week. Before we start roasting, we check the moisture and density of the green coffee beans. We do this initially so we can set the start temperature of the roast. A bean that is grown at a higher altitude will usually have a higher density and vice versa. This is due to the range of temperatures that the bean will experience at their particular altitude while growing. Beans with a higher density will need a higher start temperature as they need more heat to penetrate their strong cell structure. After the initial roast, we continue to monitor the green coffee for moisture and density – so that we know we are storing it at its best too. During the roasting process, we use three sensory milestones known to us as grass, hay and bread. These are used as a way of monitoring the roast, and it helps to ensure we get each roast spot on every time. When each of these sensory milestones has passed, we listen out for the first crack. As the roast develops, we will monitor the ‘rate of rise’. This is so we can ensure that each bean spends the right amount of time in each stage of the roast. By monitoring the roast in this way, we can predict when the first crack will be. If we have a coffee that has more fruity notes, we will aim for the first crack to be slightly earlier. On the other hand, if we have a coffee with notes of chocolate, for instance, we often aim for the first crack to be slightly later in the roast. When we hear the first crack, this signifies to us that the beans have entered an exothermic reaction. The beans can no longer take in energy, so instead, they omit it. This also signifies that the roast has entered the ‘Development Phase’ which is the time between the first crack and the end of the roast. At the desired point, the roast is dropped into the cooling bin, where a fan drags the heat out of the beans. This stops the roasting process, which in turn also stops the roasted coffee taking on ‘baked’ flavours. At any given time we have six single origin coffees available. To add to this lineup, we also have a limited edition blend. Each of our coffees have been roasted with a particular brewing device in mind. For example, three of our coffees have been crafted for a cafetiere or filter device, and the other three have been crafted for an Aeropress, Moka pot or espresso machine. This isn’t to say you cannot mix and match these to suit your taste; these are just guidelines if you need some help is all. Our coffees are available as single ‘one off’ bags in our 50g taster size or our regular 250g, 500g and 1kg bags. However, we also provide a coffee subscription service for our customers, allowing you to choose the grind size, weight and frequency of freshly roasted coffee delivered to your door. We like to encourage a little and often approach to purchasing coffee. Rather than having a coffee subscription of 1kg each month, for instance, we recommend ordering a smaller amount of 250g per week. This way, the coffee that is delivered to you is fresher and tastier. Our coffees have been crafted with different times of the day in mind too. One coffee from each roast style is crafted with the morning, daytime or evening in mind. Speciality coffee is a much higher grade of coffee in comparison to ‘commodity’ coffee. For a coffee to be given the ‘speciality coffee’ title, it must first gain a quality score of 80 points or above. The coffee is scored on a number of pointers, to include its aroma, mouthfeel and taste. Are you looking for a gift for the coffee lover in your life? We’ve got you covered with our gift subscriptions. Choose the frequency, weight, grind size and the coffee you would like, and we’ll do the rest. You can pre-pay for two to twelve deliveries for your coffee lover. If a little help is needed, our trusty wizard is on hand to help if you are unsure about which of our coffees you think you would prefer. Our wizard doesn’t have a wand to wave unfortunately, so it works out the best coffee for you by asking you four questions about your coffee drinking habits. It will then produce a customised recommendation for you. If you don’t agree with what the wizard has chosen for you, just scroll down on the last page of the wizard for a full list of all our freshly roasted coffees. Speciality coffee can be quite daunting. We want to introduce you to better coffee, but in a fun and down to earth way. What is more fun than two chimps? Love Coffee? So do we! Our promise is to introduce you to some fantastic coffees. We won’t be preachy, nor will we be snobby, but we will offer all the information needed to help you understand why you love your favourite coffee so much. We want to show you what difference altitude makes to the coffee and what washed, sun-dried and honey mean. You can check out our ‘What is speciality coffee’ page to read more about these tasty beans. If this seems like information overload, don’t worry. We just want to offer you hand-roasted speciality coffee that you will love. You can always find out more information about your coffee by using our Jargon Buster, ‘understanding coffee terminology’ too. Let’s start with that and see where this journey takes us all. We welcome your feedback and we want you to tell us what you taste. Sure, we will give our opinion, but it is yours that really matters – to us and to others. If we choose your tasting notes for the bag, we will give you free coffee, and lots of it too. Making the world confusing is bad. Things are confusing enough. We have coffees designed to suit the way you want to drink them along with when you drink them. Here at Two Chimps Coffee, we want to help your morning, noon and night become better than they already are. Start choosing your hand-roasted speciality coffee with help from our coffee wizard.